THE ULTIMATE ELVIS EVENT OF 2014 IS HERE AND WE INVITE YOU TO BE A PART OF IT. The only officially Elvis Presley Enterprises endorsed festival & Elvis Contest in Europe. Tees Events are proud to present the only official licensed Elvis Presley Enterprises festival in Europe to Blackpool “Europe’s Tribute To Elvis”. 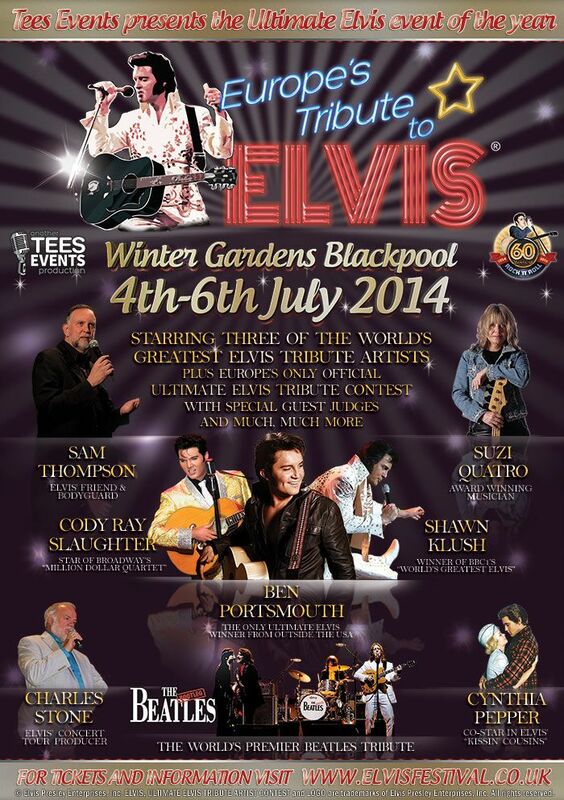 Returning for its spectacular second year at the famous Winter Gardens 4th – 6th July 2014 Celebrating the greatest entertainer of all time “ELVIS PRESLEY”. We have Special Guests, including Suzi Quatro the queen of rock, Charles Stone, Elvis Presley’s Tour Producer, Sam Thompson, Elvis Presley’s Bodyguard and Friend and Cynthia Pepper, actress and co-star with Elvis in “Kiss in Cousins”. Some of the world’s greatest Elvis Tribute Artists will be gracing our stage, including Cody Ray Slaughter, the youngest man ever to be named by Graceland as their Ultimate Elvis Tribute Artist in 2011 and star of Broadway’s Million Dollar Quartet. Ben Portsmouth, who became the first and only winner of the Ultimate Elvis Tribute Artist Contest from Outside the USA in 2012, Shawn Klush, the winner of BBC’s “World’s Greatest Elvis” and first ever Ultimate Elvis Tribute Artist Contest Winner in 2007. Europe’s Tribute to Elvis will be holding the official preliminary heat for the Elvis Presley Enterprise’s 2014 Ultimate Elvis Tribute Artist Contest, the winner of which will represent us during the finals at “Elvis Week” in Memphis. “Final Farewell Show” featuring our 2013 Champion, Ben Thompson. All shows backed by the fantastic TCE Band. After Show party with “Big Screen Disco” until 2:30am each night. Tickets are selling quicker than you can say Viva Las Blackpool, so buy quickly to avoid disappointment. ©E.P.E. Inc. Elvis, Elvis Presley, King of Rock and Roll, and Ultimate Elvis Tribute Artist Contest are registered trademarks of Elvis Presley Enterprises, Inc. All images of Elvis Presley used on this site are ©E.P.E. Inc. and used with permission.